Noted urban historian M. Christine Boyer turns to the new frontier—cybercities—in this important and compelling book. Boyer argues that the computer is to contemporary society what the machine was to modernism, and that this new metaphor profoundly affects the way we think, imagine, and ultimately grasp reality. But there is, she believes, an inherent danger here: that as cyberspace pulls us into its electronic grasp, we withdraw from the world. Transferred, plugged in, and downloaded, reality becomes increasingly immaterial. Frozen to one side of our terminal's screen, Boyer concludes, we risk becoming incapable of action in a real city plagued by crime, hatred, disease, unemployment, and under-education. In a series of polemical essays, Boyer examines cyberspace, virtual reality, disembodiment, and cyborgs, drawing on a wide range of sources from Walter Benjamin to William Gibson. In the end, Boyer issues a clarion call to reinstall a social agenda in the midst of these technological innovations. 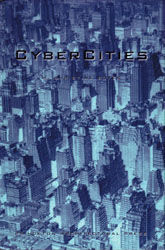 CyberCities is required reading for anyone interested in the modern city, electronic technologies, or politics. Cotton, Bob; Oliver, Richard (1994) The cyberspace lexicon an illustrated dictionary of terms from multimedia to virtual reality. Londres : Phaidon, 224 p.
A unique reference book for all those using electronic media, The Cyberspace Lexicon provides a much-needed guide through the maze of existing and emerging technologies. From interactive video and multimedia through to hypermedia, arcade games, high-band networks and virtual reality, this book explains all the essential concepts and technical terms. Techniques and technologies are defined, key concepts are explained, and 'buzzwords' are clarified. In-depth illustrated features covering major issues complement clear, concise entries designed for quick reference. With numerous colour illustrations showing the latest programs and applications, this is an invaluable sourcebook for any media professional or student. 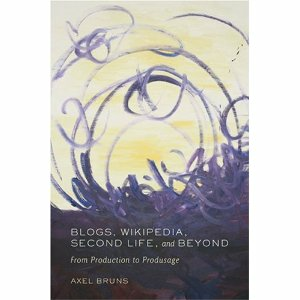 Bruns, Axel (2008) Blogs, Wikipedia, Second Life, and Beyond: From Production to Produsage. New York : Peter Lang Publishing, 415 p.
We - the users turned creators and distributors of content - are TIME's Person of the Year 2006, and AdAge's Advertising Agency of the Year 2007. We form a new Generation C. We have MySpace, YouTube, and OurMedia; we run social software, and drive the development of Web 2.0. But beyond the hype, what's really going on? In this groundbreaking exploration of our developing participatory online culture, Axel Bruns establishes the core principles which drive the rise of collaborative content creation in environments, from open source through blogs and Wikipedia to Second Life. This book shows that what's emerging here is no longer just a new form of content production, but a new process for the continuous creation and extension of knowledge and art by collaborative communities: produsage. The implications of the gradual shift from production to produsage are profound, and will affect the very core of our culture, economy, society, and democracy.